AAFCS publishes two scholarly journals: the Journal of Family & Consumer Sciences (JFCS) and the Family & Consumer Sciences Research Journal (FCSRJ). 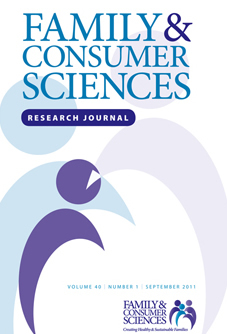 The Journal of Family & Consumer Sciences contains scholarly peer-reviewed articles, practical information geared toward family and consumer sciences professionals, and AAFCS news and information. The Journal is sent to AAFCS members as a benefit of membership, and is available by subscription for nonmembers. Nonmembers may place an order online or calling 800-424-8080. The Family and Consumer Sciences Research Journal is published in partnership with Wiley-Blackwell.AAFCS members may purchase an annual subscription (4 issues) for $45. Subscriptions are available as an add-on to membership or as a stand-alone subscription. To subscribe, members should log into MyAAFCS and click on the "Optional Journal Subscriptions" menu. The special member rate of $45 offers a 70% savings compared to the non-member rates. Nonmembers can subscribe by visiting the Wiley-Blackwell website. Looking for an article from the Journal of Home Economics? Home Economics Archive: Research, Tradition, History (HEARTH), hosted by Cornell University's Mann Library, provides full article download access for articles published in the journal from 1909-1993. The listing is searchable by year and volume. Click here to access the listing. Click HERE to find a collection of research journals, by region, published by the International Federation of Home Economics (IFHE). The listing includes scientific journals, popular scientific journals, and informative journals. Additionally, the listing provides hyperlinks to each journal that offers Information about subscriptions and manuscript submission.